The letter is asking for donations to help rebuild the boys' dormitory that burned down at the Foundation School. Ms. Evans' note says that she is sorry and wishes she could help, but she has five of her own to educate. 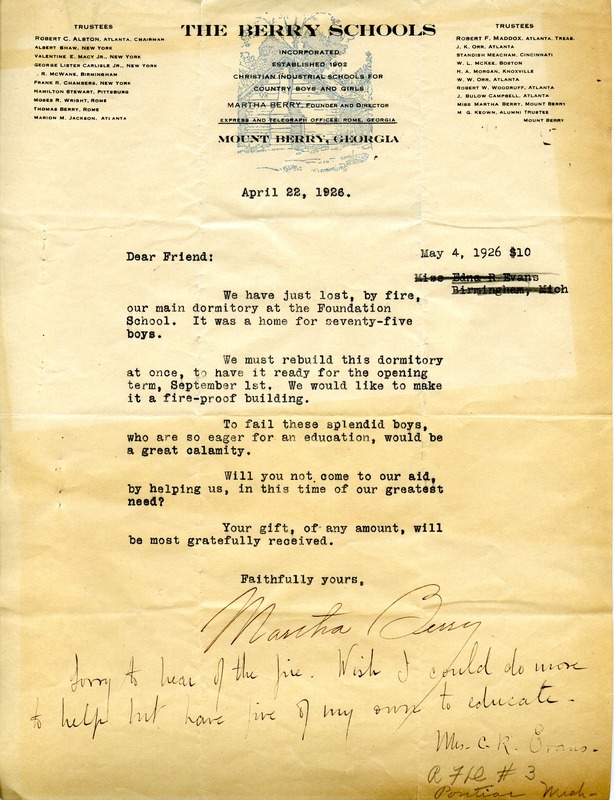 Edna R. Evans, “Note to Martha Berry from Edna R. Evans.” Martha Berry Digital Archive. Eds. Schlitz, Stephanie A., Cassie LaJeunesse, Savannah Harris, et al. Mount Berry: Berry College, 2012. accessed April 20, 2019, https://mbda.berry.edu/items/show/2053.